Jacksonville Jaguars Blake Bortles will be hosting the first ever Blake Bortles JaxPAL Football Camp this summer on June 11th from 9 a.m. to 12 p.m. in his team’s hometown of Jacksonville. The football player teamed up with the Blake Bortles Foundation and The Police Athletic League of Jacksonville to make this event happen, and only the first 500 boys and girls who sign up will get a chance to participate. All kids who decide to take part in this day for learning football will also receive a t-shirt and lunch, and everything will be completely free of charge. The age group for this football camp will accept all players from ages five to 16 at all different skill levels. The Altamonte Springs, Florida native was a star football and baseball player during his high school years and graduated his senior year with a total 27 touchdowns and seven interceptions. The University of Central Florida offered him a athletic scholarship to attend their institution where Bortles played for three years before entering the 2014 NFL Draft. He was selected as the 3rd overall pick by the Jacksonville Jaguars and has been with the team ever since. 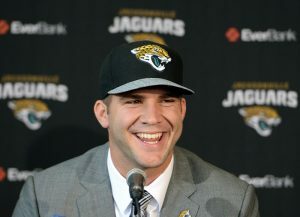 The 2010 Liberty Bowl Champion will be hosting the inaugural Blake Bortles JaxPAL Football Camp later this month, and it is sure to be a big hit with the local kids. This free event will be open to the first 500 registered children between the ages of five and 16, and is going to be packed with plenty of fun and surprises. If your company is interested in finding out availability and booking fees for a professional football player like Steve Smith Sr. or other sports celebrities for an Autograph Signing, Fundraising Event, Guest Appearance, or Football Camp, call us at 1-888-246-7141.